Popular Southern Baptist Charles Stanley is highly regarded and well respected as an evangelical fundamentalist. He is the senior pastor of a mega church in Atlanta, Georgia and served two terms as president of the Southern Baptist Convention. Charles Stanley has authored many books and preached numerous sermons on 500 radio stations, 300 television stations and several satellite networks during his illustrious religious career. Many people believe this type of enormous popularity indicates that his doctrine is Biblically sound, but under the close scrutiny of the Word of God, frightening deviations from the Bible truth can be easily detected and must be exposed so that sincere people are not deceived and led astray. Charles Stanley’s controversial divorce from his wife Anna has unfortunately done little to curtail his gargantuan worldwide influence. It goes well with his doctrine. As a hunter of any well known heretic that has turned aside from the truth, holiness preacher Dan Corner is widely regarded as an evangelical Bible teacher with an extraordinary ability to expose and refute false theology and doctrines dangerously presented to Christians. Dan Corner’s love for God and desire to see precious eternal souls (for whom Christ Jesus died) endure to the end for salvation motivate his steadfast approach to contending for the faith and refuting theological errors of all shapes and sizes. Dan Corner is a former Roman Catholic and an ordained minister. He has extensive personal experience in street and campus evangelism as well as thousands of hours dealing one on one with people from all walks of life and all religious beliefs. “Where is this place represented by the ‘outer darkness’ in Jesus’ parables? To be in the ‘outer darkness’ is to be in the kingdom of God but outside the circle of men and women whose faithfulness on this earth earned them a special rank or position of authority. The ‘outer darkness’ represents not so much an actual place as it does a sphere of influence and privilege.” (Eternal Security Can You Be Sure?, page 126). Because the heretical doctrine of eternal security is so widespread and accepted even though it is dreadfully spiritually dangerous, it needs to be exposed and refuted as never before. Dan Corner is known for the following quote: “The greatest doctrinal threat to holiness is the heretical doctrine of eternal security or once saved always saved.” Dan Corner has masterfully dealt a deathblow to this doctrine of demons on his apologetic website and in his many evangelical writings, not the least of which is his greatest work entitled, The Believer’s Conditional Security: Eternal Security Refuted. Dan Corner preaches that once saved always saved teaching logically leads to a license to sin. Anyone who falls prey to this heretic deception will, in the least, let his guard down by believing that all his past, present and future sins have already been forgiven even before they were committed. How long could it take before such a person would lose his salvation and not even think his sins would have to be confessed or forsaken for salvation? Many eternal security teachers even claim that King David did not lose his salvation in both adultery and murder together before he repented. Such is clearly a heretic concept. Dan Corner has skillfully exposed the historical elements of eternal security in his well researched work cited above. Many will be shocked to learn that the first time eternal security is taught in the Bible is Genesis 3:4 which states, “You will not surely die,” the serpent said to the woman. Jude wrote by the inspiration of the Holy Spirit that those who change grace into a license to sin (which is exactly what eternal security teachers do) are godless men who deny Jesus. Jude does not state one good thing about the grace changers and instead urges true Christians to contend against this heretic lie of the devil. Jude states in verse 19 that these scoffers are divisive and do not have the Spirit of God. How then could they be saved brothers with whom Christians should associate, support or promote in any way? 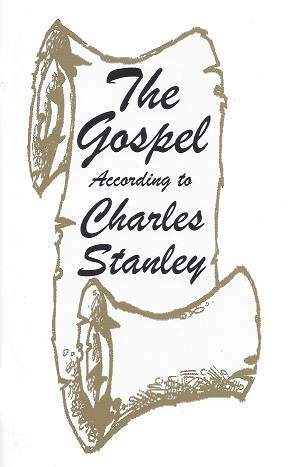 The Gospel According to Charles Stanley (Dan Corner has refuted the false doctrine of eternal security in a 42 page booklet which exposed Stanley. Dan Corner penned an open letter to Charles Stanley. The Believer’s Conditional Security is Dan Corner’s massive 801 page work by which he refuted various eternal security teachers. Hundreds of articles, video and audio which have exposed eternal security are on line. Dan Corner provided an insightful review of Charles Stanley’s heretic book on Eternal Security.